Summer is quickly fading away and it is time to start making that shopping list of items we need to start our year off right. With the help of School Outfitters I will be crossing off a few items on my wish list. They have generously given me a gift certificate to use in their store and have given me a second one to give away to one of my lucky readers. As I perused their on-line catalog, I began to add items to my cart. Before I knew it, my cart was a little full and way over budget. Here are a few of my great finds. I was thrilled to find these great containers. I have been searching for some colorful containers and they are a great price too. I added a few jumbo ink pads as well. I intend to use all my stamps this year and need more than just basic black ink. I like that these are big and the ink is washable. I just learned about this bell at the I Teach K conference. It seemed magical and I think my kids will really like it. I've had my eye on these magnetic white board spinners for a while. I can't wait to use them. Now it is your turn to make your wish-list. What would you do with a $100 gift certificate to School Outfitters. I would buy a Colorful Classroom Organizer. I would get the tabletop pocket chart, a set of classroom timers, and dice. Storage!! I need more storage! I want the No Yell Bell and bins for organization. I would love some Cubby Tubs to reorganize my classroom library. Thanks! 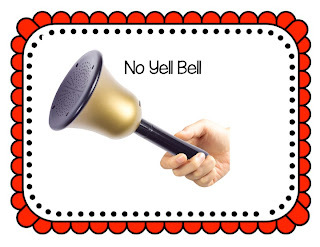 I would like to incorporate the no yell bell into my classroom management. The no yell bell would work so well in my classroom! 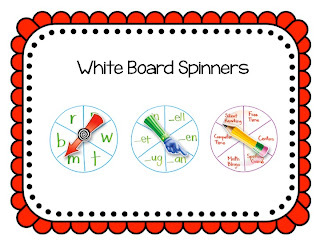 Love those whiteboard spinners...oh the possibilities! I would love anything to help organize my classroom so the day runs smoothly!! 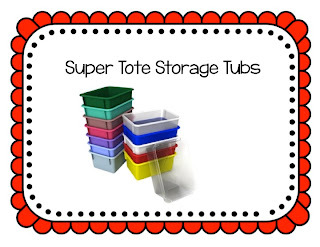 I would love storage bins and I NEED a new set of student white boards! Mine have been loved for years! I need ink pads too! They seem to dry up so quickly. I'm pretty sure I could use that $100 just for inkpads. So many cute stamping centers offered this summer. Thanks for the chance to win. I would really like some seat sacks! 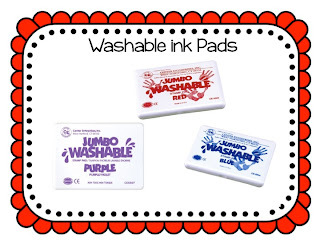 I would love some of the write and wipe pockets and ink for stamping centers!! I love the "No Yell" bell, whiteboard spinners, and storage bins. Can a teacher ever have enough of those? There is a CD listening center that I would love to have. The adorable polka dot chart tablets!!! I would love the classroom timer and new storage bins would be great! I'd purchase a tabletop pocket chart, timers, and carpet squares. I'd really like some more timers and seat sacks. I would LOVE a rug. I have always wanted one, but they are so expensive. $100 off would make them affordable! :) Thank you! I really need storage containers and tubs. I would love some nap time pillows for my classroom library! What a great giveaway Tiffani!!! I'd love some new Hot Dot sets, the Eggspert and heck, there's just too many neat things to choose from! ink pads, pocket charts, ink pads. 1st year teaching, i need everything. Those magnetic spinners look awesome! Anything for storage or organization! I would LOVE to buy a rug but may have to buy something a little more fun! I would get a storage cart! I love the spinners for the white board!! I would love a document camera, but be happy with new lap whiteboards. I'm easy to please. I would love storage containers, stamp pads, and a new seating rug! I would love to get some stools and things to help me organize! I would love a no yell bell or storage containers. I have a huge wish list. I would love to have a classroom rug...I've been wanting one for years! I'd like the No Yell Bell, kiddos get tired of hearing a teacher's voice sometimes. I also need a rug for my classroom and seat sacks for my student chairs. I think the No Yell Bell would be awesome for my classroom! I really really want a walk on # line, the no yell bell, and on, and on! Thanks for the chance to win! I really, really want a walk on # line, the no yell bell, and on and on! Thanks for the chance to win! I would love that no yell bell! I think my students would respond so well to that! I would love the seat sacks!!!!! I would love to win so I can purchase an executive chair for my classroom. I have serious back issues and having a good chair to sit in for reading groups would make a huge difference for me! Thanks for this amazing giveaway! I need a no yell bell! I would like the math counters, the table pocket chart and the spinners. I would like to buy some new colored bins so that I can reorganize my classroom library this year! Colored bins for my books is what I really need. I would get construction paper, paint and other art supplies! My kinders love to create extension to stories and just for fun. I do not want them to lose their creativeness! I would love to have the bell, a table top pocket chart and a jumbo timer. I can always use stuff like velcro too! I would love some storage tubs, a jumbo timer and a chart tablet. I also teach in No California. I like those whiteboard spinners! Why haven't I seen those before?? I want the NO YELL BELL too!!! I want those kid stamp pads! ....and a class set of crayons, markers, and all other art supplies. I really need the No Yell Bell ,,,sounds like a great idea! Combination Tackless & Tackable Bulletin Bars for that brick wall outside my room and the weather and calendar pocket chart! I would beget a tabletop pocket chart and a no yell bell. Wonderful opportunity....thank you!!!! I am most interested in the NO Yell Bell or maybe a table pocket chart holder. So many choices. I'm with you on the no-yell bell. Two of the first grade teachers got those last year and LOVE them. Of course, there are TONS of other things I would love. New stamp pads, another table top pocket chart. I will have my own room for the first time, so it is really hard to choose, but my dream item would be an office chair and desk as my room has no furniture. But I would probably buy classroom essentials. Thanks for the opportunity! I was looking at the good stuff on the School Outfitters page, and I decided that if I had $100, I would get a 24W x 18H Franklin Dry Erase Board, a bean bag chair, and various stamps and stamp pads! School Outfitters has become my new go to place for the classroom. Love the NO Yell Bell idea. So many great ideas on the site. I would love to have the Build and Play Table for my students. Great to store and play with out Legos and Duplo blocks. I would love to have Hot Dots! I would like the No Yell bell and the white board spinners. I need some things for organization! This bell looks really neat! They have tons of things I like. Oh gosh, I want some new organizing tubs....they would be perfect! I would also get some construction paper and paper! I would get some new stamps and ink pads. I would love the rainbow blocks, hot dots jr. alphabet and phonics activities. I've had my eye on the simple stopwatches. 4 of those would go in my cart for centers! I would love to buy some new dry erase boards for the kiddos, or a classroom organizer, or the no yell bell...shall I go on? I could use new white boards! I want to get the same bins as you, but in purple!! I have never heard of the no yell bell..so I am off to check it out!! Oh, WOWZERS!!! I think I REALLY need the No Yell Bell (LOVE, LOVE, LOVE the inventor of this product!!! )and I definitely need ALOT more storage bins since I am redoing my classroom library!!! Oh, WOWZERS!!! I know I need the No Yell Bell (I would like to hug the inventor) and a ton more storage bins since I am redoing my classroom library right now. Wow what an opportunity! I really need some Califone Animal headphones and some paper trays for my classroom. I'm going to need a new calendar pocket chart, no yell bell, and a few white board spinners. Thank goodness for PTA money!!! Oh, I have been wishing for a seating rug for so long! I've beern in my classroom for 22 years and have tried placemats, rug samples, foam pieces, everything. The floor is SO uncomfortable for my kinders' bottoms and my knees. I wish for a nice listening center. All I have is a CD player that kids sti close to so they can hear. I used to have the old cassett kind with the huge head phones but it was soooo old and stopped working. Now I have 95% CDs. I need some new bean bag chairs, dice, storage containers. . . . I want to get storage containers to house activities for my early finishers. I would also love to get the bell. It looks like an awesome tool for classroom management. I would love to have some of the Hot Dots activities. Awesome giveaway! Thanks for being so generous. There are so many things that I could use! I would LOVE to get some more games/activities for letter and phonics skills.